Applications are now being accepted from Washington artists and crafters to participate in the 2019 Crafts Day at the Lake Forest Park Farmers Market, which will take place on Sunday, July 21st. Crafts Day is a once-per-summer special addition to the regular Farmers Market, which takes place every Sunday from 10am to 3pm from Mother’s Day through mid-October. Artists and crafters of all kinds are encouraged to submit applications for consideration in this juried event. 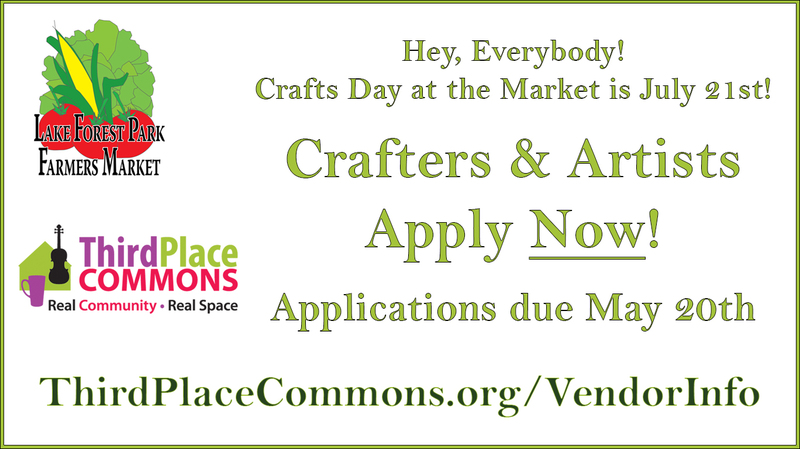 Please visit the Third Place Commons website and review the Crafts Day application carefully for full details. All applications must be submitted via postal mail and received no later than Monday, May 20th. The Lake Forest Park Farmers Market is presented each year by Third Place Commons, a 501(c)(3) nonprofit organization committed to fostering real community in real space. It is located at Town Center at Lake Forest Park at 17171 Bothell Way NE. The market season opens as always on Mother’s Day, Sunday, May 12th, and will continue to run every week rain or shine through Sunday, October 20th.